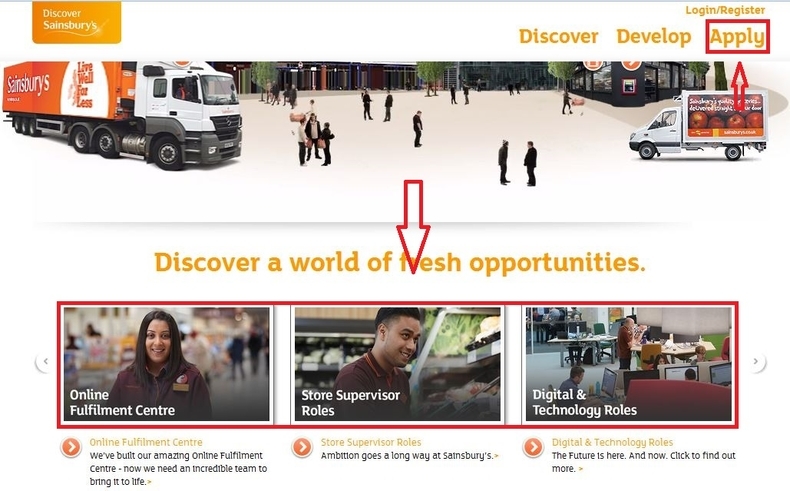 Go to sainsburys.jobs and land on Sainsbury's careers page to get more information about its careers. 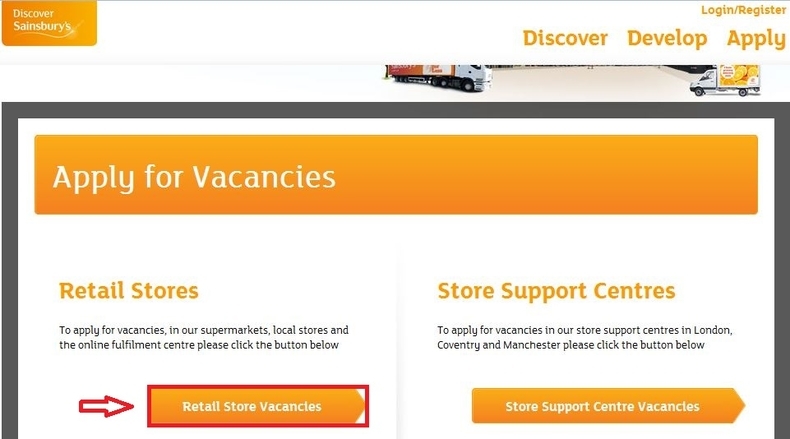 Sainsbury's provides job vacancies in several areas and among which you can choose one to view the details and then click "Apply Now" to proceed. Or you can click the "Apply" button on the upper right corner of the page to continue. Here we choose to click the "Apply" button to move on. Choose an area you want to apply for and then click the corresponding button to start to find job vacancies. 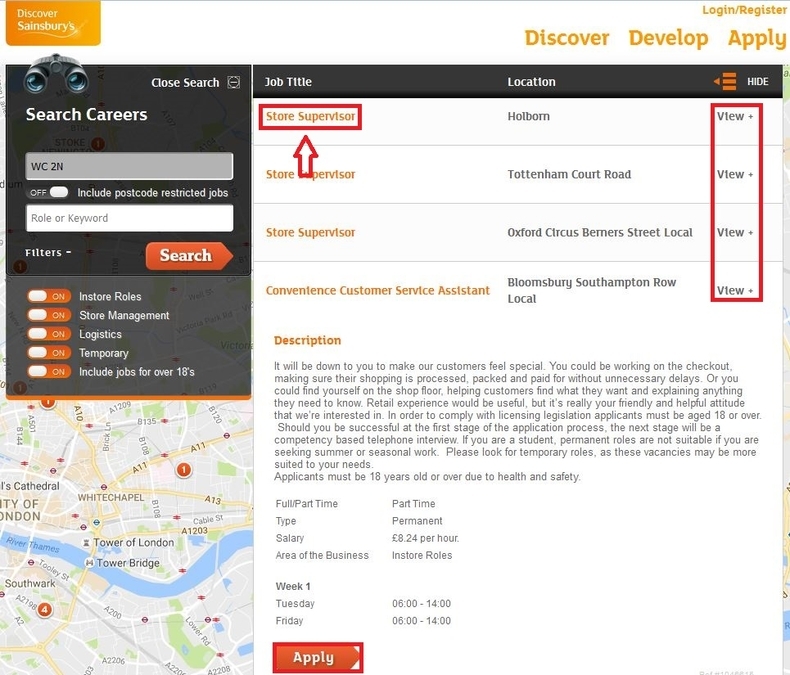 Sainsbury's job vacancies are available in two areas: Retail Stores and Store Support Centers. To set you an example, here we choose to click "Retail Store Vacancies" to search job opportunities in retail stores. Enter your postcode and click Next to find opportunities near you. 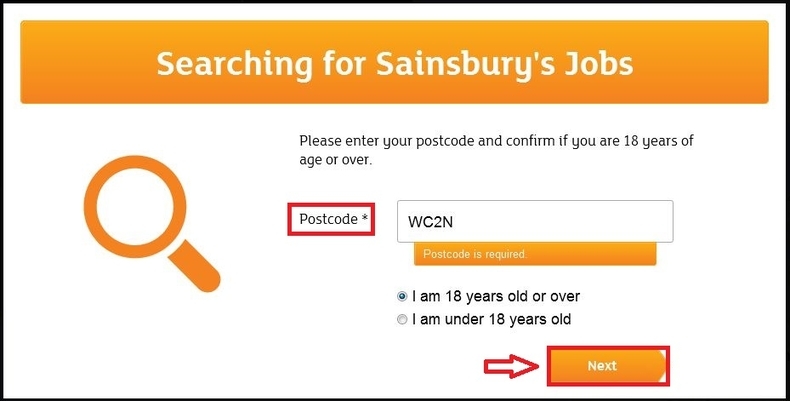 To search job vacancies, you need to enter your postcode and confirm if you are 18 years of age or over first. Here we enter the postcode of London to go through the application process. Browse your search results or filter the list by the criteria on the left side and then select the one you are most interested in. You can click "View+" or the job title to browse more information of each position and think about which position you are going to apply for. Once you make a decision, just click the "Apply" button below the job description to start your application. Here we choose to apply for the first position on the list - Store Supervisor. 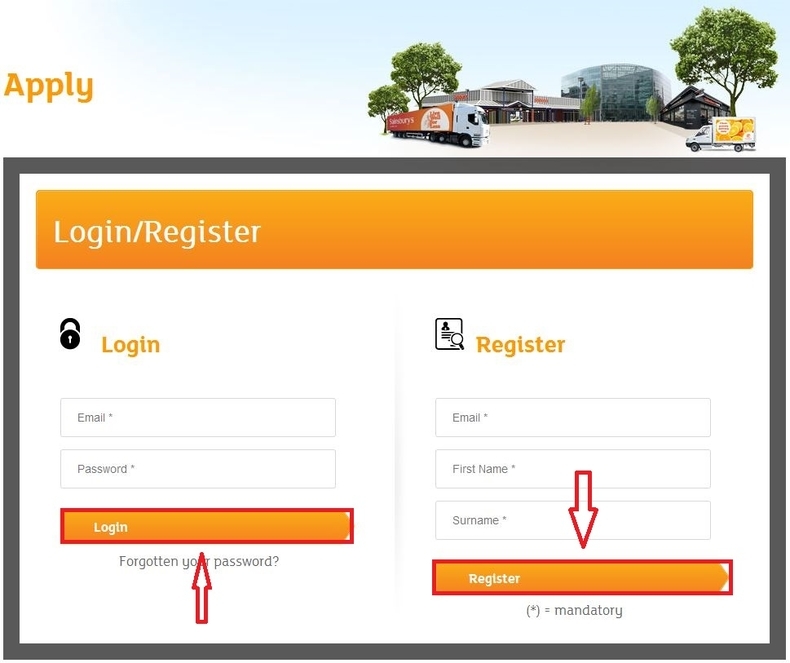 To apply for a position at Sainsbury's, you need to log in or register. Enter your email and password to log in. If you are a new user, you need to register with your email address and then activate your account through the email received. 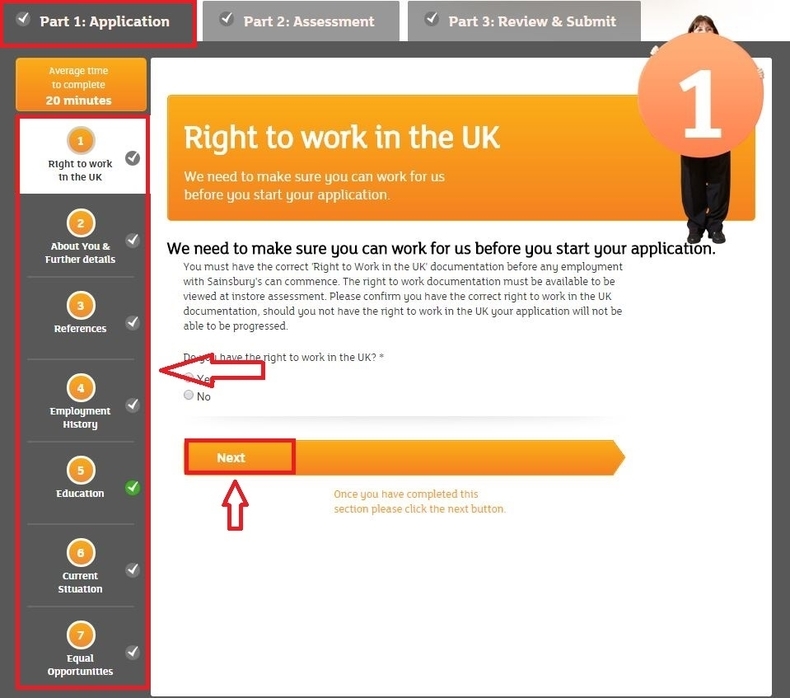 Fill out your application information starting from indicating your right to work in the UK. The whole application process contains 3 parts. This is the first part which includes 7 small parts, such as your right to work in the UK, your personal details, references, employment history, education, current situation and equal opportunities. You need to finish each part and then click the "Next" button to continue. In this step, you need to answer some background questions and complete a situational judgement test. 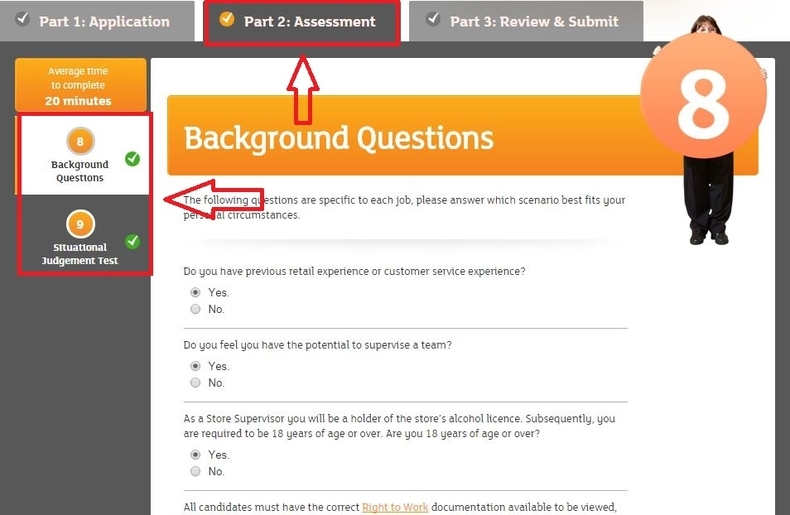 When you finish the background questions, just click the Next button at the bottom of the page to move on to the test which contains 15 situational questions. 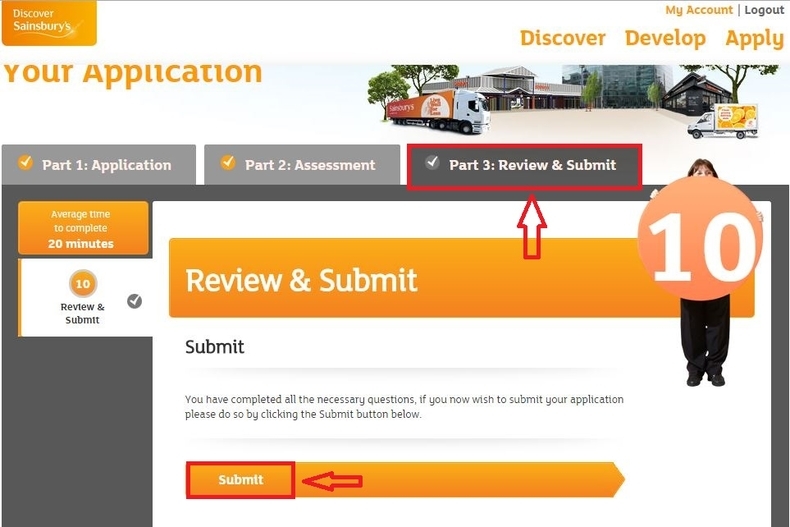 After you finish the test, you need to click "Part 3: Review & Submit" to proceed. The final step is to review and submit your application. If you have missed some information, you will see an "Edit and Continue" button which you can click to modify the corresponding part. You can also review and revise the information you've provided by clicking the relevant part. If you have completed all the information and you are sure that the information you provided is correct, just click the button to submit your application. The whole application process has been finished after you click "Submit". Sainsbury's recruitment team will review your details and will endeavor to get you back as soon as possible. You can click the link to review the status of your application. 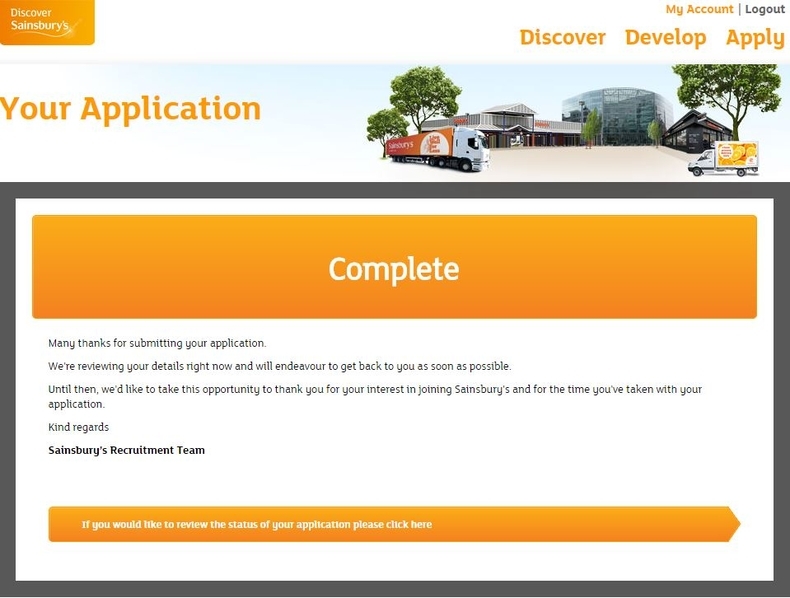 Click sainsburys.jobs to apply for Sainsbury's jobs online.